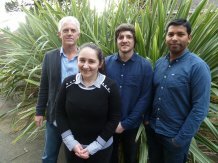 Members of the research team who developed the innovative technique. Engineering experts from the University of Exeter have developed innovative new memory using a hybrid of graphene oxide and titanium oxide. Their devices are low cost and eco-friendly to produce, are also perfectly suited for use in flexible electronic devices such as 'bendable' mobile phone, computer and television screens, and even 'intelligent' clothing. Crucially, these devices may also have the potential to offer a cheaper and more adaptable alternative to 'flash memory', which is currently used in many common devices such as memory cards, graphics cards and USB computer drives. The research is published in the leading scientific journal ACS Nano. Professor David Wright, an Electronic Engineering expert from the University of Exeter and lead author of the paper said: "Using graphene oxide to produce memory devices has been reported before, but they were typically very large, slow, and aimed at the 'cheap and cheerful' end of the electronics goods market. "Our hybrid graphene oxide-titanium oxide memory is, in contrast, just 50 nanometres long and 8 nanometres thick and can be written to and read from in less than five nanoseconds -- with one nanometre being one billionth of a metre and one nanosecond a billionth of a second." Professor Craciun, a co-author of the work, added: "Being able to improve data storage is the backbone of tomorrow's knowledge economy, as well as industry on a global scale. Our work offers the opportunity to completely transform graphene-oxide memory technology, and the potential and possibilities it offers." The work was carried out in collaboration with IBM Zurich under the auspices of the EU FP7 project CareRAMM (grant number 309980).